Looking for a House, Condo or Townhouse for sale in the Eagle Harbour area of West Vancouver? The Eagle Harbour region is a charming waterfront community en route to Horseshoe Bay along Marine Drive in West Vancouver. Fisherman’s Cove, Eagle Harbour, and Eagle Island are all part of this area’s delightful natural habitat. Sensational waterfront homes are built along the shoreline, each with their own distinctive design to optimize the landscape and panoramic views. The Eagle Harbour region is comprised of the Eagle Harbour, Eagle Ridge, and Gleneagles neighbourhoods. Real Estate in Eagle Harbour is centered around the boating community. There are three marinas in the area: Eagle Harbour Yacht Club, West Vancouver Yacht Club, and Thunderbird Marina. Houses in Eagle Harbour, Eagle Ridge, and Gleneagles are strategically located on the bluffs and ridges that are a part of the natural landscape of West Vancouver. Each home is unique, and carefully designed to fit on the lot. Homes have been built to maximize the incredible views. Because these streets and homes are built into the rugged hillsides, the grid layout followed in the eastern parts of West Vancouver is no longer used for the road layout. Please contact us to search for real estate in Eagle Harbour. Boating is a big part of this area’s allure! The marina’s in the area provide year-round boat moorage and launching facilities. Eagle Harbour School and Parc Verdun are a great place for the kids to play. 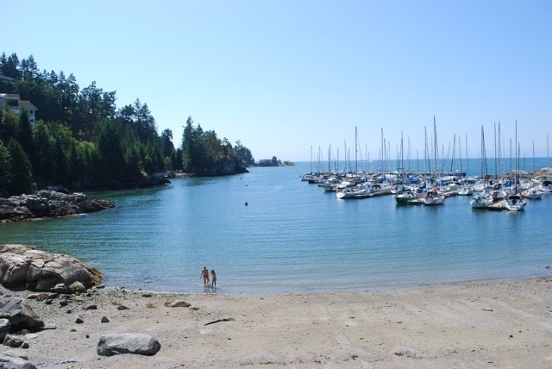 Eagle Harbour beach offers a sandy swimming area with public restrooms. The Seaview Trail runs along the mountainside from Gleneagles to Eagle Harbour. 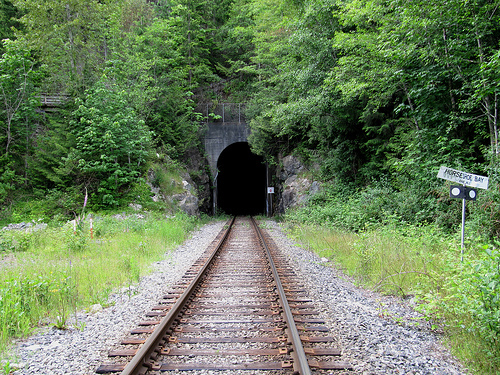 The trail is an old railway line offering spectacular views of the harbour. Skiing, mountain biking, and other recreational activities are accessed up the hill at Cypress Bowl Provincial Park. The closest shopping is the Caulfeild Village Shopping Centre (the core of Caulfeild). The village has a supermarket, bank, doctors, and an assortment of boutique shops, restaurants, and cafes. There are also numerous shops and services to the east along Marine Drive in Dundarave, Ambleside, and at Park Royal Shopping Center. You can also drive 5 minutes to the west to shop in Horseshoe Bay and visit the BC Ferries Terminal. You can golf at the 9-hole Gleneagles Golf Course. There is also the Gleneagles Community Center with fitness facilities and gym. Caulfeild Village hosts Ocktober Fest in the fall and other community events. There is a public library in Ambleside. The West Vancouver Community Center, with a pool and ice rink, is located nearby at 21st and Marine Drive. The community is served by Gleneagles Elementary, Eagle Harbour Elementary, and by Rockridge Secondary school. There are also two private schools in West Vancouver: Collingwood and Mulgrave. Residents have a choice of taking the scenic route along Marine Drive through the village communities of West Vancouver to the Lions Gate Bridge or accessing the Upper Levels Highway to drive to downtown Vancouver in just 20 minutes! Regular transit runs along Marine Drive to downtown Vancouver. Our Primary objective is to ensure that you, our client, achieves your goals through a process that is both fulfilling and rewarding. We focus exclusively on the residential market of West and North Vancouver.